Watch SEC college football live with Kodi and the best streaming sports addons. This season the SEC boasts 56 games in 13 weeks. Each team plays 8 games, 6 against division rivals, and 2 for non-division. The championship game will be played in the Mercedes Benz Stadium in Atlanta, Georgia on December 2nd. 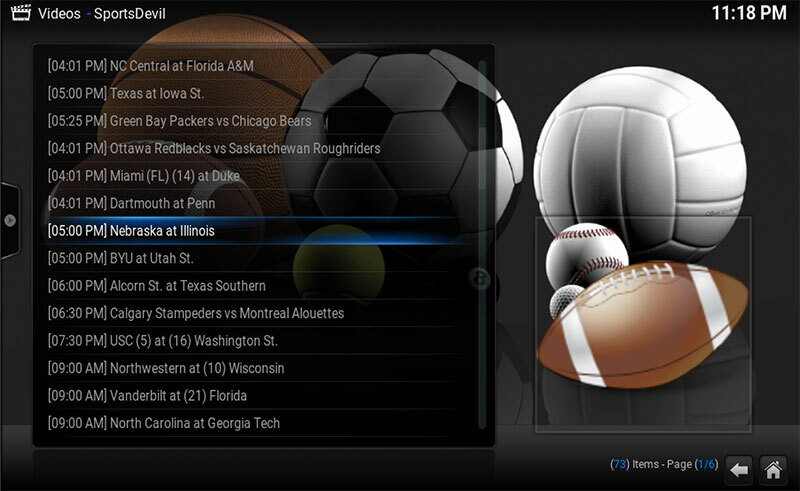 Stream the entire SEC football season for every college team and watch the championship game with Kodi and Sportsdevil. View the entire SEC 2018 football schedule here. Another great option for streaming every game in the 2018-19 SEC college football season is to sign-up for a Fubo.tv trial. If you’re a cord-cutter like us, then Fubo.TV is exactly what you need. Not only will get instant access to HD streams of every college football game, you’ll also get access to regular cable channels like the NFL network, ESPN, FS1, FS2, Fox Sports, FX, bein Sports, BTN and many, many more. Before you start streaming college football online, you need to sign up for a VPN. Virtual private networks make sure your IP address is hidden to protect your identity from would-be hackers. They also prevent your internet service provider from logging what you do online. ISP’s are notorious for throttling download speeds to high bandwidth consumption users. This drastically effects streaming and causes buffering issues. ISP’s also block known servers for streaming through Kodi and the web. IPVanish has the best VPN and the price is cheap. You’ll be glad you signed up for one. If you haven’t already done so, follow one of our step-by-step articles to easily install Kodi to your media device. Ares Wizard and SportsDevil no longer work properly. Most of the video add-ons that were great at streaming football games have been shut down due to FCC lawsuits and FBI ant-pirating initiatives. As a result, repositories like SuperRepo and Ares Wizard are no longer around. The good news is we can now get the latest and greatest of Kodi add-ons from Git Hub. Follow our easy guides below to install Git Browser and joker Sports for the best SEC live football streaming in 2018. Recent lawsuits have taken down some of the best Kodi add-ons in the past couple months. It’s been a scramble to find alternatives for streaming but Ares Wizard has come back to fill that void. Follow our simple guide for installing Ares Wizard on Kodi Krypton 17 here. Sportsdevil was a casualty of the new lawsuits against Kodi-addon providers, but it’s back and working great. We’ve tried many other versions out there, but Ares Wizard was the only one we found to have a functional Sportsdevil. 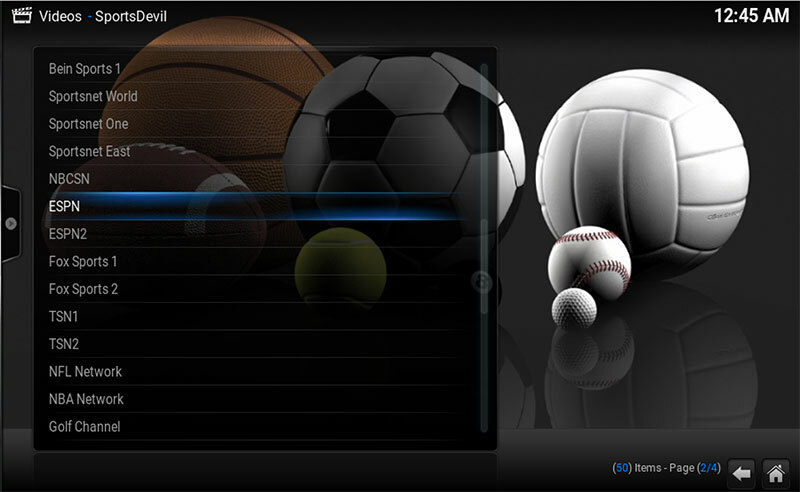 If you didn’t follow the link at the bottom of our Ares Wizard installation guide, click here to follow the steps to install Sportsdevil. Once you have it installed return here to see where to go in SportsDevil for SEC College Football links. You’ll see a long list of available tv channels to stream your games from. am I able to watch Pac 12 games the same way or is there a different addon? I have Spectrum internet, IPVanish, the latest Kodi, and Sportsdevil has rarely worked at all for me, and never for an SEC network game.